It’s 2019. You can order groceries from your phone, perform an eye exam from the comfort of your couch, or send $20 to your friend across the country. Seriously, the advances in technology over the last decade blow my mind. And with all the forward leaps we’ve made, you’d expect the web to follow suit. You’d hope your online experience would be nearly as personal as it is in real life. We see examples of personalization in real life nearly every day— the handwritten thank you note from a brand thanking you for a purchase, your favorite snack waiting for you when you check into a hotel, or a waiter remembering your name when you return to your favorite neighborhood cafe. The concept makes us stop, appreciate the effort, and respect the company’s attention to detail. But until recently, it’s been uncommon to see this tactic online. Why is that? In the past, online personalization—the concept of making a web experience unique for every visitor—was difficult or time-consuming to implement. But nowadays, there are plenty of tools and tactics that businesses can use to personalize their funnels with ease. Below, we’ve pulled together some of the most effective personalization tactics we’ve observed from SaaS marketing (since SaaS customers are generally also in tech, this sector tends to be the furthest along in personalization). We’ll also explain how you can apply these concepts to your own product initiatives. Each and every visitor wants to feel special—it’s a basic tenant of human nature. And in 2019, visitors want to be treated like they are really special. In fact, recent surveys show that 42% of consumers get annoyed when their content isn’t personalized, and 66% of consumers will not purchase from a site when they feel the content does not speak to their specific interests. Personalization is no longer a nice-to-have—it’s a necessary part of any successful product or website. When a user is returning to a site rather than visiting for the first time, they shouldn’t be sent to the same page. Instead, a company should recognize a returning visitor as a customer and present them with the most relevant experience for their location in the funnel. Gusto accomplishes this technique flawlessly. 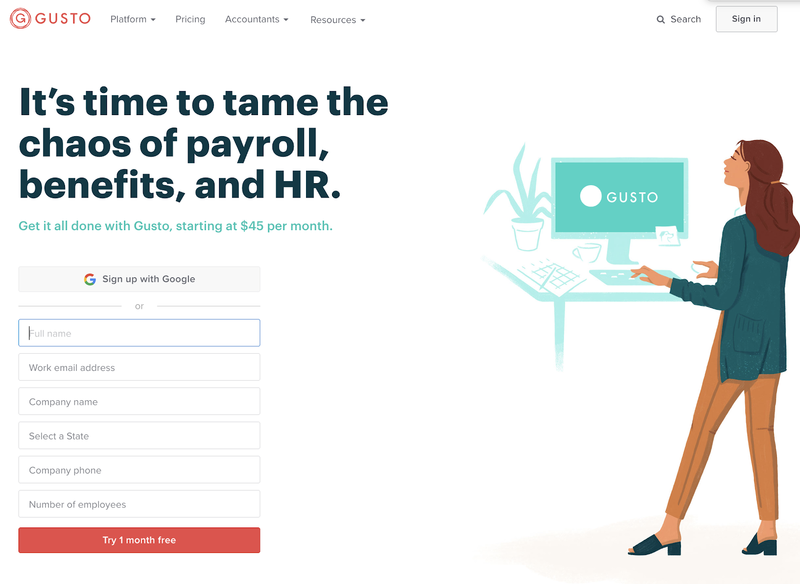 When you visit their homepage as a first-time visitor, you’re taken to a landing page that guides you to sign up for their service—“it’s time to tame the chaos of payroll”—and positions Gusto as the solution to all of your HR woes. But if you return to the same homepage and now are a customer, you are taken to a slightly altered version of the page. The design and look are nearly the same as the previous experience. 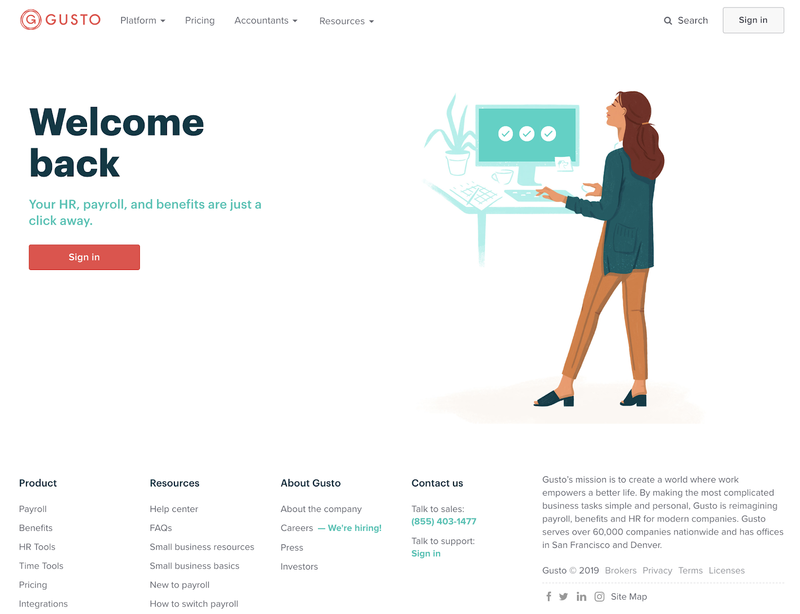 But rather than prompting for account creation, the page warmly says “Welcome back” and provides a CTA to log back in to the app. It’s clean, it’s delightful, and it makes you appreciate the attention to detail put forth by the Gusto team. How do you personalize product experiences for returning users? When a user logs back into your app, you should think about the experience like Gusto’s marketing team does. First, think about the relevancy of the content you’re showing each user on login. Rather than assuming that every visitor is at the same stage in the user journey or that you have one user persona, dig deeper and think about the process from your user’s perspective. Second, it’s important to ask yourself: Are there delightful ways to add warmth at login for returning visitors? Adding a friendly message to celebrate milestones when they occur (i.e. “Happy belated bday Ben! Hope it was great 😊” or “Happy 1 year customer anniversary!”). More than a third of online activity is spent watching video, and over 51% of marketers say that video has the best ROI of any channel. While video has a whole host of uses—from acquisition to onboarding and beyond—one of the most effective ways to use video is to increase engagement throughout the funnel. So how do you successfully integrate video content into your site and make sure that people actually watch it? It may seem fickle, but humans love hearing and seeing their own name. Using a video customization tool such as Vidyard, you can integrate your prospect’s name directly into a video on a landing page. As they watch the video, they’ll be pleasantly surprised (and maybe a little weirded out) as they see their own name integrated into the clip. While it’s not a completely customized video, from the visitor’s perspective, it seems like it is. That personal touch can give customer engagement a boost and lead to your visitors taking action. How do you use personalized video in-product? Whenever you integrate a user onboarding video, an explainer video, or welcome message into your app, think about the ways you could add additional delight for your users. As a user, having a video start with “Welcome, Molly!” or some other friendly greeting can really make an impact. 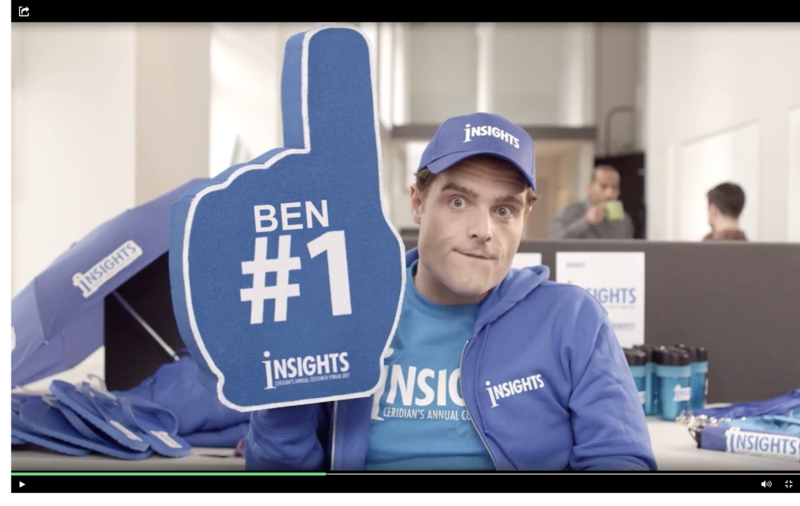 If you’re pursuing a high-value potential customer, you could take this method a step further and create an actual on-off personalized welcome video from your team. This tactic won’t scale as easily, of course, but when used strategically it’s a small detail that could make a big difference. As a product manager, you already know that it’s better to not have to ask for information you already have. That’d be like asking a close friend for their name or job title—which would feel odd, careless, and even offensive. 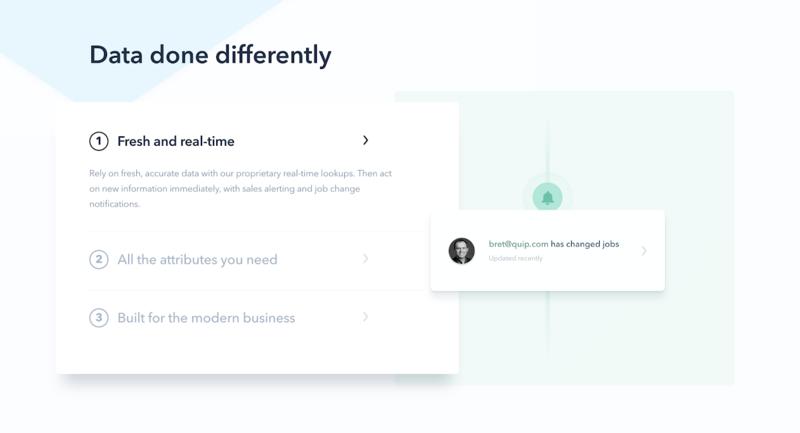 Now, thanks to Datanyze, Clearbit, and other digital marketing tools, it’s easier than ever for SaaS marketers to pull a whole host of information on a visitor and customize the page for them. How can you remove points of friction in your product? This principle holds just as true within a product as it does on a marketing site. Enriched data can be used throughout your product to reduce friction and make the experience more seamless. If you own the signup flow, for example, consider pulling in as much information as possible without your users’ having to type it in manually. It’s common practice for marketing sites to feature the logos of keystone businesses to show off the popularity of their product. Calling out your biggest customers is a great way to get SaaS businesses to trust your service. But at Proof, we realized that social proof wasn’t just about name-dropping the big customers—it was about showcasing the right customers to the right people. That’s why we personalize our landing page by industry—and customize the displayed logos and headline copy to reflect the characteristics of each unique visitor. For instance, a SaaS visitor would see the logos of Samcart, Lawnstarter, Demio, Callpage, and Drift. But an ecommerce marketer would see the logos of Harry’s, Speedo, and Pupsocks. 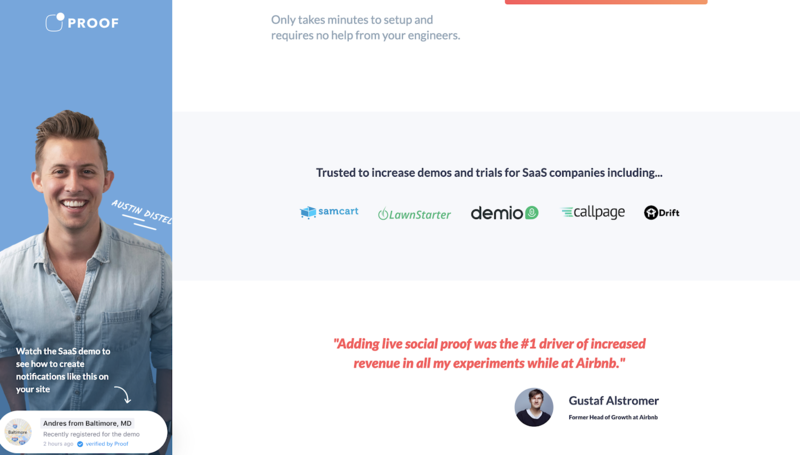 How can you use social proof within the product? In marketing, it’s important to convince visitors why they should use your product by showing the authority of voices they trust. Within your product, your approach should be slightly different. Rather than simply telling your visitors what others are doing, in-app messaging presents a unique opportunity to educate users about best practices for their industry. For example, when a user is creating a campaign, rather than inundating them with options, use the data at your disposal to make industry-specific suggestions—tell your SaaS customers that that “most SaaS companies use these settings” or “X% of SaaS companies saw an increase” using this setting. Suggestions like these are a great way to educate users on best practices while simultaneously positioning yourself among admirable brands. While web personalization is still in its early days, it’s quickly becoming common practice across just about every type of website and experience. Web 3.0 has already begun, and personalization is a key part of that shift. To keep up, your team should be looking ahead and thinking creatively about ways to personalize your customer journey and delight your users with personalization from start to finish—from your marketing landing page to user onboarding flow and beyond. For more on product personalization, check out 5 ways to personalize your user onboarding experience.